Paul Manafort pictured in Washington DC in April 2016. 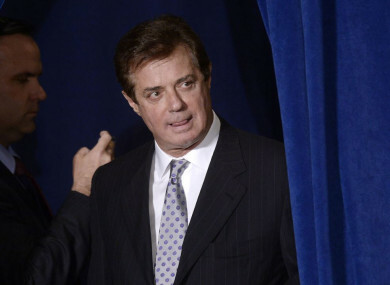 DONALD TRUMP’S FORMER campaign chief Paul Manafort will today become the first member of the US president’s election team to face trial on charges stemming from the probe into Russian interference in the 2016 vote. Manafort (69) has pleaded not guilty to 18 counts of bank and tax fraud related to his lobbying activities on behalf of the former Russian-backed government of Ukraine. Selection of a 12-member jury for “USA vs Manafort” begins at 10am (3pm Irish time) today before US District Court Judge TS Ellis in Alexandria, Virginia. The trial is expected to last about three weeks. Mueller has indicted a total of 32 people so far in connection with his probe into whether any members of Trump’s election campaign colluded with Russia to help get the New York real estate tycoon into the White House. Trump has repeatedly denounced the special counsel’s investigation as a politically motivated “witch hunt” and denied there was any collusion with Moscow to defeat Democratic presidential nominee Hillary Clinton. While Gates and others, including former national security advisor Michael Flynn, have pleaded guilty, Manafort has refused to strike a deal and has insisted on having his day in court. Email “Trump's former campaign chief to face trial today ”. Feedback on “Trump's former campaign chief to face trial today ”.